This spring, expect to find riding gear that’s packed full of performance features, with both modern and traditional elements of style. Practical, performance-oriented gear can still look good, however. “What’s great is being able to add that pop of color and detail to riding wear,” adds Portnoy. This year, she says you can expect to see fashion elements that give the English rider the chance to have some fun but still feel appropriate, with less of the super blingy or bright extremes. Jeans—a mainstay for riders—have seen some modern updates in fit and design details, and for English riders, denim and jean-style breeches bring the look and comfort of your favorite fashion jeans into a saddle-friendly format. The looks are also more wearable beyond the barn. 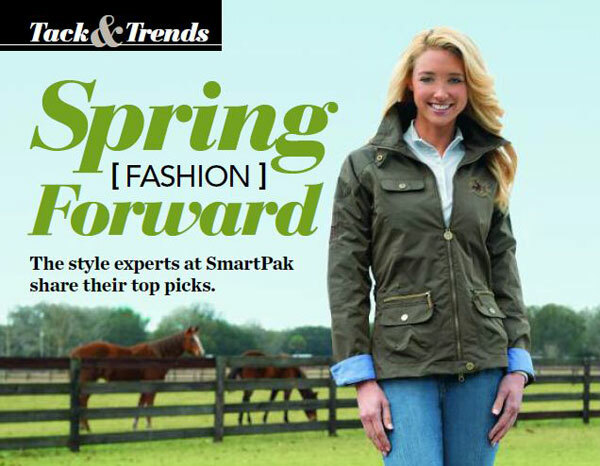 This perfect spring jacket is lightweight, windproof, waterproof and breathable. Paired with Wrangler Cash Dream Believer Jeans in a perfect rise for riding, with flat seams and a vented boot cut for all-day comfort in the saddle. Made with just the right amount of stretch to be flattering in and out of the saddle. Justin Women’s AQHA Ostrich Remuda Boots set you apart in a crowd or in the ring. Designer jeans meet riding breeches! Ariat’s Vintage Horse Print Polo is sure to be a hit at the barn and beyond. Alexus Riding Top by SmartPak does double-duty for show or schooling. Lightweight, breathable material has 50+ UPF sun protection. Alexus Knee-Patch Breech by SmartPak is designed for the equestrian athlete. Innovative fabric provides flattering coverage without bulk. Kerrits Venti Tank features slimming princess seams and fast-dry Cooltek fabric. Get your groove on in paisley print. Kerrits Microcord Full-Seat Breech in stretch-rib fabric with tummy-flattering V-panel. ELT Laetizia Jacket is waterproof and breathable, with detachable hood and riding vents in back. Bradley Full-Seat Breech by SmartPak is fashion-forward in denim with contrast stitching and fun floral embroidery on the back pocket. SunShield Short Sleeve Shirt by SmartPak blocks 98 percent of harmful UV rays. Piper Low-Rise Knee-Patch Breech by SmartPak comes in a modern cut and colors, at an attractive price point for schooling.